We were an elite among altar boys. We could light our Turibles in a force 10 gale, swap our gleaming pattens from hand to hand without batting an eyelid and our synchronised genuflection was, purely and simply, the talk of the sacristy. The nuns of the Convent required four sturdy lads to serve at their Easter Ceremonies. These volunteers would be required to infiltrate the convent walls, witness ceremonies other boys would never dream of, and eat hard boiled eggs in the convent dining room. We felt we were ready. We each brought their own particular skills to the team. For instance, Plu Kilcawley's two-kneed genuflection may have owed more to Bruce Lee than to Saint Martin De Porres but it would always strike mortal fear into those heretic hoards out beyond the altar rails. For my own part, I was known to be 'good' with a communion bell - very good. That whole weekend remains embedded in my memory. There was the sad and silent Good Friday ceremony with the passion reading that would not end. There was the Holy Saturday midnight mass where a huge crucifix had to be carried backwards up the central aisle under the steely gaze of the nuns. There were those eggs afterward. The time before the mass was severely dragging its heels. So, when some non-serving mates invited me out for a game of football, it seemed like a good idea. When the game was over, I had to grab my bag and run for the convent at the last moment. I got there but only just. The nun's seats all ran at right angles to the altar and each had her own little compartment in which to perch. The gig went just fine - up until the moment that the priest announced the 'Ceremony of the Washing of the Feet'. I turned to Skippy Hopper. I most certainly was not! I looked down at my own feet and winced. Bath Night was just a distant memory and all that football had done nothing to improve them. I kicked off my shoes. Father Gilhooley approached us carrying an angelic white ceramic bowl and a pristine white cloth. He stooped in front of Plu, took his leg and dipped his bare foot in the bowl then, removing it, made a nominal gesture toward patting it dry. I was the last in line. The priest kneeled before me and, only then, became aware of the dreadful condition of my feet. He gave an audible sigh, motioned the offending articles into the bowl, rolled up his sleeves and set to work. Soaking one end of the cloth in the water he scrubbed and buffed my poor under-attended feet. The nuns in their compartments leaned forward and craned to see what was happening. When he finally rose, the bowl had a rich grey ring just above the water line, the cloth was beyond reasonable repair but my feet were Christian once again. He glared at me and shook his head sadly before returning to the altar. And, even though my subsequent communion-bell-work was well up to par, I don't think he ever really forgave me. Very enjoyable story. I have no first-hand knowledge of Catholicism but I've seen enough and read enough to get the idea. I set my last novel in a fictionalised Ireland and had to do a lot of reading to get my mind in the right frame. There's only a short scene in it where there's a priest but he was fun to write. A couple of weeks back I got to see the film of Puckoon which I have no doubt you'd appreciate. I'll get around to posting a review on my blog one of these days. I love 'Puckoon' and I love dear Spike. I love the pub that sits with one corner on the other side of the border so the drink is tuppence cheaper in that bit! Poor priest probably thought you were doing it deliberately for some sort of bet. It was such an oddly visceral weekend. I think it was the 'eating of boiled eggs' at 1.30am on Easter Sunday that really messed me up. Beautiful eloquence! I have a couple of memories that I wouldn't mind writing about, they're actually quite funny little stories if I just took the time to write them. In my current mood, though, they are much funner to tell than to write. When the mood is right I may get around to it, I'm just having too much fun living the lives of others for now. In any case, I was delighted to read this story, and in fact I guffawed mightily in anticipation of the dirty bowl to come. You tell a great yarn, Ken. It might surprise you to learn that I'm a huge fan of "Father Ted". We've just recently seen "The Priests" in concert on television and my Kevin said, "I can't possibly not think of Father Ted and "My Lovely Horse"! P.S. With those eggs, I had visions of something along the lines of "Cool Hand Luke" coming into play. That's so funny. At least the priest didn't hold his nose! Funny. Nostalgic. I'm a former alter boy myself. Thanks for a great story. Lol, I could very well imagine this scene. The priest must have thought you were trying to test his endurance..lol... I'm a catholic myself and during my younger days, I never missed any of these required rituals. It was a must and a responsibility to attend ALL of them from the pre-advent prayers, to the fasting during Fridays (no meat too), to the stations of the cross, through the Holy week, seven last words, black Sabath ,to Easter Sunday. In the Philippines, which is predominantly Catholic, some people have a yearly ritual in which they actually undergo crucifixion and flagellation as a penance for their sins. The Church does not encourage this practice but the people believed that it is one method of cleansing their souls. Your story has shed some sunshine in this gloomy week and I am sure that this is what Holy week is really all about - rebirth and redemption. Wonderful post. You should write a memoir. I won't tell him this story yet, 'k? Dirty feet were nothing out of the ordinary. As usual, this is a fun read! How can a 12 year old refuse a game of football? It's too bad there's not an "Altar Boys'" magazine. I'm sure you would win The Brass Altar Server statue in the story competition. "There was the Holy Saturday midnight mass where a huge crucifix had to be carried backwards up the central aisle under the steely gaze of the nuns." "He gave an audible sigh, motioned the offending articles into the bowl, rolled up his sleeves and set to work." I still get a kick out my dad's now-infamous story about how he and his brothers completely lost it when someone farted in a pew. Magic! Your name-selection is the Irish equivalent to Wodehouse, by the way. This was so funny! Especially to someone like me, raised fundie, with no real knowledge of the rituals of other churches. But really -- your experience showed what the foot-washing thing is really all about, after all. 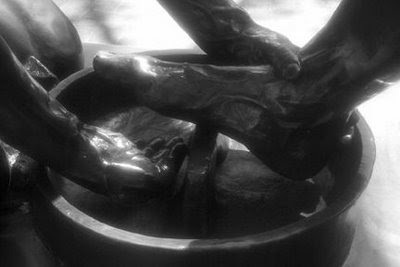 I doubt when Jesus washed people's feet, he expected them to have been cleaned and perfumed beforehand -- he was washing real, used, dirty feet, to show what service actually means. So you might have inadvertently lived up to the real meaning of the ritual, better than anyone else there! Heh. Kat: When you first mentioned The Priests, I had no clue who/what you meant. I do now though, and I always think of Father Ted too. Did you give me that subliminally, I wonder? :) BTW follow @glinner on Twitter - he co-wrote Father Ted. Poetikat: I'm getting repetitive in my old age, true. I just can't resist putting this back on front on Holy Thursday. I plan to tell about another (any very different) Holy Thursday next year, provided I am still here. I like the Wodehouse thought - it is interesting to note that every name used in this post is quite real. The etymology of such names as Plu, Skippy and even Slaba Ford, is interesting in itself and I must do a post about it sometime. Phyl: Interesting point. I don't think the priest appreciated my attempts to authenticate the ritual though. Cupcake: push button bells, how tragic! The bells were tricky, they really were... and the patten, wow, I could write a book on it all. I wasn't aware Catholics practiced the washing of the feet- my aunt goes to a small "non-denominational" church, who does. I was raised in the Church of Christ, so Easter was never a huge religious holiday. I'm learning more about you each time I read something you write. At the moment, I'm glad I don't have a thing for feet-or hard-boiled eggs. Very funny Ken, I can just imagine his face and yours. If your mam was amongst the parishoners i'm sure she'd have been mortified. But you know boys will be boys and football is a muddy game. Surely the PP would have played a game or two in his time.